The blood brain barrier (BBB) is composed of endothelial cells, astrocyte endfeet and pericytes held together by tight junction proteins and adherence junction proteins within the neurovascular unit (NVU) [1, 3, 6]. The BBB maintains homeostasis and various approaches have been developed to safely and effectively open or bypass it [7-16]. Image-guided low intensity pulsed focused ultrasound (pFUS) coupled with an infusion of ultrasound (US) contrast agent microbubbles (MB) serves as a noninvasive approach for transiently opening the BBB that can specifically target areas within the brain . Gadolinium (Gd) contrast agent-enhanced magnetic resonance imaging (MRI) can be used to visualize the post-sonication BBB disruption (BBBD), which can be confirmed on histology by extravasation of plasma proteins into the parenchyma . Pulsed FUS+MB can generate acoustic radiation and cavitation forces within targeted tissues. Forces from stable MB oscillations within the vasculature and/or inertial cavitation (unstable oscillations) at the endothelial surface send pressure and/or shock waves into the NVU  that can induce a sterile inflammatory response (SIR) . The SIR develops as an immediate cascade of pro-inflammatory and anti-inflammatory cytokines chemokines and trophic factors (CCTF) and damage-associated molecular patterns (DAMPs) associated with BBBD along with immune cell infiltration within the targeted tissues. The SIR also involves cyclooxygenase 2 (COX2) and nuclear factor kappa-light-chain-enhancer of activated B cells (NFκB) pathways [2, 5]. Elevation in heat shock protein 70 (HSP70), a DAMP, has also been detected in pFUS+MB-treated brain and is often part of the complex molecular changes in the parenchyma associated with SIR . However, the upregulation of genes associated with NFkB pathways, which induce SIR, was not observed with the infusion of 10 µL/kg Definity® and pFUS with passive cavitation detection (PCD) feedback six hours post treatment [4, 5]. These results suggested that pFUS+10 µL/kg Definity®-induced BBBD did not lead to elevations in genes associated with SIR; however, the lack of sampling of tissues at multiple or earlier time points does not preclude that existing baseline levels of cellular mRNA could have resulted in proteomic changes in the targeted tissues . Recently, single or multiple MRI-guided pFUS+MB BBBD were used as a part of proof-of-concept studies for decreasing amyloid β (Aβ) plaque burden or hyperphosphorylated Tau (pTau) with improvement in functional outcomes in models of Alzheimer's disease (AD) [7, 21-26]. AD is associated with chronic inflammation characterized by the accumulation of Aβ aggregates in the extracellular space and intracellular hyperphosphorylated Tau (pTau) within neurons and astrocytes along with microglial activation [24, 27]. Pro-inflammatory cytokines, including tumor necrosis factor alpha (TNFα), interleukin (IL) 1β and IL6, that increase NFκB expression, have been shown to modulate the chronic inflammation in AD [27-30]. Various approaches are under investigation to interrupt the neurodegenerative processes that lead to neuronal death that has been associated with significant morbidity and mortality in AD patients [29, 31-35]. pFUS+MB-induced BBBD coupled with an infusion of specific antibodies reduced Aβ plaques and pTau pathological burden [22, 25, 26, 36]. Clearing of Aβ plaques has also been demonstrated with pFUS+MB-mediated BBBD alone based on the hypothesis that endogenous antibodies enter into the targeted parenchyma, facilitating phagocytosis by activated microglia [7, 23, 37, 38]. Multiple weekly sonications with MB infusions in AD models have focused on the histological changes in the brain and have not routinely included serial follow-up MRIs, which would be used in clinical trials, to evaluate pathological corroboration of the persistence of BBBD, microhemorrhages, or neuronal loss [7, 21, 22, 26, 36, 38]. Here, we report serial brain MRIs following a single or six weekly pFUS+MB resulting in BBBD in the left cortex and the right hippocampus in normal rat. Animals receiving one pFUS+MB treatment had limited MRI and pathological findings at 7 and 13 weeks post sonication. Animals that received 6 weekly pFUS+MB exposures had pronounced changes on MRI, primarily on T2*w images, and on pathological examination when compared to contralateral brain, consistent with damage to the parenchyma. The studies were approved by the animal care and use committee at our institution and experiments were performed according to the National Research Council's Guide for the Care and Use of Laboratory Animals (2011) . 6 to 8-week-old female Sprague Dawley® rats were used in all experiments (Charles River Laboratory, Wilmington, MA). Rats first underwent baseline T2-weighted (w) MRI (Figure 1A) to exclude brain abnormalities that would serve as exclusion criteria . Rats were then divided into three cohorts (n=6/group) and were sonicated once and euthanized at week (W) 7 or 13 (Group A and B respectively) or were sonicated 6 times weekly and were euthanized at W7 (Group C). In order to determine if pFUS stimulated neurogenesis, rats were treated for three consecutive days with intraperitoneal injections of 5-Bromo-2′-deoxy-uridine (BrdU, 300 mg/kg; B9285, Sigma Aldrich, St. Louis, MO) prior to pFUS+MB to label proliferating cells including neural stem cells in vivo. The dose of BrdU was chosen based on a previous report for assaying neurogenesis in rodents . MRI was performed on a 3 T MR scanner (Achieva, Philips Healthcare, Andover, MA) equipped with a surface coil (RK-100, FUS Instruments, Toronto, ON), while anesthesia was ensured by isoflurane (1-3.5%) in 100% O2 via a nose cone. Throughout MR scans, warm water was circulated under the animals to ensure 37 °C body temperature; a steady respiratory rate was monitored using a pressure sensor (SA Instruments Inc., Stony Brook, NY) and maintained at 40-50 breaths per minute by controlling the level of isoflurane/oxygen mixture. For the pFUS experiment, targeting coordinates were obtained from axial T2w images before sonication: turbo spin echo (TSE) with repetition time/echo time (TR/TE) of 2000/60 ms. Pulsed FUS was performed with the following parameters: 0.3 MPa or 0.5 MPa peak negative pressure (PNP) measured in water that was applied with a 10 ms burst length and <1% duty cycle with a pulse repetition frequency (PRF) of ~0.5-0.6 Hz (i.e., 120 s/9 focal points in the left frontal cortex including the striatum, 120 s/4 target points in the right hippocampus (Figure 1B)) using a single-element spherical FUS transducer (center frequency: 548 kHz, focal number: 0.8, active diameter: 7.5 cm; FUS Instruments, Toronto, ON). pFUS PNP of 0.3 or 0.5 MPa (in water) was selected based on contrast enhancement on GdT1w images depending on animal's age. The center of the FUS transducer was fitted with a hydrophone (822 kHz) for PCD from each focal spot. For this study, PCD data was collected for the sonications and processed using proprietary software from the manufacturer (FUS Instruments, Toronto, ON) and MATLAB (Mathworks, Inc, Natick, MA). PCD data was not used as part of a feedback loop to modulate PNP during sonication because it appeared that the proprietary manufacturer software assumed an infusion of MB at the start of sonication in order to modify PNP as part of the feedback process. In this study, pFUS was not initiated until MB were at near steady-state levels in the vasculature (Figure 1C) and the algorithm used for PCD feedback may not be compatible with this infusion protocol [2, 42]. Rats were first infused with 100 μL gadopentetate dimeglumine (Gd, Magnevist, Bayer Healthcare Pharmaceuticals, Inc., MA) via tail vein prior to sonication. Thirty seconds prior to initiating pFUS, an intravenous infusion of OptisonTM (GE Healthcare, Little Chalfont, Buckinghamshire, UK, 1.66 μL/s) was started that continued to 100 µL (i.e., 30 s) during sonication to targeted regions in the left cortex anterior to the lateral ventricle and the right hippocampus with nonoverlapping 2-mm diameter focal regions (Figure 1B-C). Only one dose of 100 µL OptisonTM [5-8×107 MB] was administered as a slow infusion independent of animal weight for all pFUS treatments, which resulted in contrast enhancement consistent with BBBD on GdT1w MRI. The initial dose (Day 0) for all groups was ~460 µL/kg of OptisonTM IV. Infusion of MB was separated by >5 min between sonicated regions. Immediately post pFUS+MB, axial T1w images were obtained by TSE (TR/TE 350/12 ms). Groups A and B rats were sonicated once at 0.3 MPa in both locations whereas animals in Group C were sonicated 6 times (Figure 1A). Following the third pFUS+MB treatment in the Group C rats, the PNP was increased to 0.5 MPa due to the lack of Gd enhancement on T1w images. Group C rats recieved progressively lower doses per kg of body weight of OptisonTM as rats became heavier during the study. The subsequent 5 OptisonTM doses in Group C rats were as follows: 2nd pFUS=404 µL/kg, 3rd pFUS=442 µL/kg, 4th pFUS=420 µL/kg, 5th pFUS=386 µL/kg, and 6th pFUS=377 µL/kg, which are all equivalent by dose to 5-8×107 MB for each rat. High-resolution MR images at 3 T were obtained with a 7-cm solenoid coil (Philips Research Laboratories, Amsterdam, Netherlands): T2w axial TSE (TR/TE 2769/60 ms), T2*w axial (TR/TE 1301/7.0 ms), number of echoes 5, ΔTE 7.0 ms, flip angle 30°, GdT1w axial TSE (TR/TE 600/20 ms). All high-resolution images at 3 T were interpolated to an image resolution of 100×100 µm in-plane with an acquired slice thickness of 500 µm. In vivo MRI scans at 9.4 T were performed on a Bruker 9.4 T scanner (Bruker Corp., Billerica, MA) using a Doty radiofrequency quadrature coil (Doty Scientific, Inc., Columbia, SC). 3D T2*w images were then acquired to evaluate the presence of T2* abnormality using multiple gradient echo: TR/TE 60/3.2 ms, ΔTE 60/3.3 ms, number of echoes 14, image resolution 200 μm3 (isotropic). The final T2*w images were generated by combining the multiple echo data with an effective TE of 22.7 ms. Both 3 T and 9.4 T high-resolution MRI scans were obtained at set time-points following pFUS+MB exposures (Figure 1A). Quantitative T2* maps of the brain were obtained using MEDx image analysis software (Medical Numerics, Bethesda, MD), fitting the signal intensity (S) of each voxel from the gradient-echo images to a mono-exponential decay as a function of TE: Si = S0 exp(-TEi / T2*). Volume-of-interest (VOI) encompassing each pFUS-treated and contralateral cortexes and hippocampal regions over all MRI slices were drawn to extract brain voxels from the T2* maps by an experienced technologist. The total number of voxels from each VOI was determined and used to normalize the frequency distribution of the number of voxels with a specific T2* value using standard spreadsheet software. Normalized histograms of the T2* data were used for further statistical analysis within the range of T2* values from 4 to 98 ms. Lateral ventricular volumes were determined using MEDx image analysis software (Medical Numerics, Bethesda, MD) based on maximizing the contrast between cerebral spinal fluid and parenchyma from the T2w images. The total lateral ventricle volume from each slice was added together for each animal in a group. Rats (n=6 per group) were euthanized either at 7 weeks (Group A, C) or 13 weeks (Group B) post pFUS with 4% (w/v) paraformaldehyde perfusion. Fixed brains were embedded in paraffin and sectioned at 3 or 5 μm. Brain sections were stained with hematoxylin and eosin (H&E) and immunofluorescent staining (IFL). IFL detected neuronal nuclear antigen (NueN), glial fibrillary acidic protein (GFAP), ionized calcium-binding adapter molecule 1 (Iba1), cluster of differentiation 68 (CD68) and phosphorylated Tau from at least 3-6 sections from each animal. Every fluorescent staining was counterstained with 4',6-diamidino-2-phenylindole (DAPI) at a concentration of 1 ng/mL to label cell nuclei. Primary antibodies used for IFL: chicken anti-NeuN 1:500 (ABN91 Millipore Burlington, MA) rabbit anti-GFAP 1:1500 (Ab 7260 Abcam, Cambridge, MA), goat anti-Iba1 1:200 (019-19741 Wako Chemicals USA, Inc., VA), mouse anti-CD68 1:400 (Ab 955 Abcam, Cambridge, MA) and anti-BrdU antibody 1:400 (B8434, Sigma Aldrich, St. Louis, MO) according to the manufacturer's instructions for identifying dividing neural stem cells. Mouse anti-phospho Tau (MN1050 Thermo Fisher Scientific Waltham, MA) was used to label phosphorylated Tau-containing cells for immunohistochemistry that was counterstained with hematoxylin. The secondary antibodies were from Abcam (Cambridge, MA) and were used in 1:1000 dilutions for the following antibodies: goat anti-rabbit antibody (Ab102293, Abcam, Cambridge, MA) for GFAP; donkey anti-goat antibody (Ab150129, Abcam, Cambridge, MA) for Iba1; and the donkey anti-mouse antibody (A21059, Thermo Fisher Scientific Waltham, MA) and MACH 2 mouse HRP-polymer goat anti-mouse-HRP secondary antibody (MHRP520 Biocare Medical Pacheco, CA) for pTau that were used at the manufacturer's provided concentration. PB staining was performed as previously described  to determine the presence of metallophagocytic cells in the treated cortex and hippocampus. Aperio ScanScope CS equipped with a 20x air objective (NA=0.75, Leica Microsystems, Buffalo Grove, IL) was used for microscopy. Three sections from each brain were used for quantitative analysis. High magnification (63x) images were taken with an Olympus fluorescence microscope (BX61 Olympus, Center Valley, PA). A laser scanning confocal microscope (model 710, Carl Zeiss AG, Oberkochen, Germany, www.zeiss.com) using Plan-Apochromat objectives (20x air, NA=0.8) was used for confocal microscopy. Illumination was provided by argon-ion (Lasos, Jena, Germany, www.lasos.com), diode and diode-pumped solid-state lasers (Roithner Lasertechnik, Vienna, Austria, www.roithner-laser.com). Histological evaluation of the microscopy sections was performed at 20x magnification for both cortex and hippocampal regions of all animals in each group. For Iba1, fluorescence signal was quantified using Image J (Version 1.5; National Institutes of Health, Bethesda, MD) by setting thresholds from 10 fields-of-view (FOV) in the defined regions in pFUS-treated and contralateral brain from three histological sections and the mean fluorescence signal was calculated per animal. For GFAP, positively stained area was quantified relative to the whole treated region with ImageScope Viewing Software (Leica Biosystems Inc., Lincolnshire, IL). Quantification of the numbers of CD68+ macrophages and BrdU+ cells in treated and contralateral brain were counted manually from IFL and averaged over all animals in the group. Protein extracts were isolated from paraffin embedded tissue using Qproteome FFPE Tissue Kit (Qiagen Inc., Valencia, CA). Protein extracts were purified with methanol precipitation to remove denaturing agents prior to quantification. 8 M Urea (Sigma Aldrich, St. Louis, MO) was used to reconstitute protein pellets along with a protease phosphatase inhibitor cocktail (Cell Signaling, Boston, MA). The concentration of isolated protein was determined using BCA Protein Assay Reagent (Pierce, Rockford, IL). 10 µg of protein was separated on a NuPAGE 4-12% Bis-Tris precast gel (Thermo Fisher Scientific, Waltham, MA) and electrophoretically transferred to polyvinylidene difluoride (PVDF) membranes (Millipore, Billerica, MA). Membranes where incubated with the primary antibodies against phosphorylated Tau protein 1:1000 (MN1040, Thermo Fisher Scientific, Waltham, MA) and B actin (BA) 1:5000 (ab8227, Abcam, Cambridge, MA) at 4 °C overnight. Chemiluminescent substrate detection (SuperSignal West Pico PLUS Chemiluminescent Substrate, Thermo Fisher Scientific, Waltham, MA) was used to develop bands. Western blots (WB) were performed in triplicates. Densitometry analysis was done using Image J and the signal intensity corresponding to pTau was normalized to BA signal intensity. Electronic 32-bit scans of WB were used for quantification with the rectangular section tool to highlight each band of interest. A profile plot was created representing the relative density of the contents of each band after the straight-line section tool designated the bottom of each curve. Two independent reviewers who did not have knowledge of which bands were assigned to hippocampus or cortex or groups of animals obtained the signal intensity and groupings, while statistical analysis was performed by a separate author. The enclosed peaks in each profile plot correspond to the dark bands in the original blot. The ratio of relative density for pTau/BA was calculated and plotted. All values are presented as mean ± standard deviation. Statistical analyses and data presentation were performed with Prism (Version 6, GraphPad Software, Inc., La Jolla, CA). Statistical analysis for the T2* histograms to determine mean T2* values was performed using JMP software (Version 13, SAS Institute, jmp.com). Histograms were smoothed by a running average of 5 over the range of T2* values using standard spreadsheet software. For histograms and ventricle volume, Student's paired t-test was used to compare descriptive statistics from sonicated to untreated brain within each group at each time point (i.e., week 2, 7 and 13) to avoid changes due to age of the rats. For histology, unpaired t-test was used for comparison. p values<0.05 were considered significant. pFUS+MB was performed with 9 focal points to the left (Lt) cortex and 4 focal points to the right (Rt) hippocampus. The experimental outline for the three groups of rats and the timing of BrdU administration are shown in Figure 1A. All animals tolerated pFUS+MB to both regions without complications. There was no significant difference at week 7 in the mean weights for Group A (262.3±26.7 g), Group B (280.8±43.1 g) and Group C (265.3±27.4 g) rats. At the end of the 13th week, Group B rats' mean weight was 315.0±34.0 g. Representative MRI at 3 T and 9.4 T from Group A and B rats are presented in Figure 2. For this study, Figure S1-4 contain the acquired sets of rostral to caudal MR images in order to display the extent of pathology in animals presented in Figure 2-3. Figure 2A contains MRI sections approximately 4 mm from the superficial cortex from a Group A rat. pFUS+MB parameters were used based on contrast enhancement on GdT1w MRI with qualitatively increased signal intensity in areas of BBBD. T2*w images reveal scattered hypointense voxels in the Lt cortex at W2 and W7 post pFUS+MB. There was no evidence of hypointense voxels in the area of the Rt hippocampus. Figure 2B-C are representative post contrast T1w, T2*w and T2w images of two Group B rats at ~7.5 mm from the superficial cortex at various time points. Figure 2B shows no change detected from baseline MRI over the 13 weeks. In Figure 2C, the T2*w image at 9.4 T acquired 1 day after pFUS+MB was unchanged compared to the baseline; however, by W2 the rat developed a focal hypointense region in the Lt cortex that persisted through W13. Fifty percent of Group B rats exhibited the appearance of hypointense voxels in sonicated cortex on the T2*w images between day 1 and week 2 MRI sessions. There were no MRI differences between sonicated hippocampus and contralateral parenchyma. Overall, 33-50% of Group A or B rats had evidence of T2* hypointense voxels primarily in the Lt cortex with rare changes in the Rt hippocampus when compared to contralateral brain. There were also no differences in the mean T2* values for the sonicated brain regions or Lt lateral ventricle dilation in Group A and B rats (Figure 3C-D, 3F and Table S1). MRIs from Group C rats displayed evidence of pathology following the second sonication continuing through W7 scans. Variable amounts of contrast enhancement were observed in these rats on GdT1w images immediately post sonication such that by W4, it was necessary to increase the PNP from 0.3 MPa to 0.5 MPa in order to obtain BBBD in the cortex or hippocampus (Figure 3A). The increase in PNP was needed possibly due to changes in skull thickness and weight gain that resulted in a decrease in MB/kg concentration in the animals or possibly shortening of OptisonTM intravascular half-life from repeated exposures in the rat . pFUS PNP at 0.5 MPa starting at the 4th sonication was the minimum pressure that resulted in BBBD visible on GdT1w 3 T MRI using the infusion protocol for OptisonTM (vide supra) with animals inhaling 100% O2. Figure 3B contains representative MRIs obtained at 3 T from two different locations at W7. Fifty percent of Group C rats had persistent BBBD on GdT1w images along with hyperintense areas on T2w images at W7. All Group C rats had hypointense voxels on T2*w images in the sonicated regions of the brain (Figure 3B and Figure S4). A significant difference (p=0.012) was detected in the mean T2* values in the LT cortex for Group C rats after two sonications (Figure S5, Table S1). At W7, the T2* values (mean and skewness) were significantly lower in the multiple sonicated Lt cortex (p<0.001, p=0.009) and Rt hippocampus (p=0.044, p=0.02) compared to contralateral brain (Figure 3E, Table S1). Quantitative analysis of the Lt and Rt lateral ventricle volumes revealed a significant difference (p=0.03) in the Group C rats (Figure 3F). For this study, a feedback algorithm based on PCD to control the FUS pressure  was not used; however, ultraharmonic frequencies (i.e., frequency (f) at 1.5 and 2.5 from f0=548 kHz) were collected and analyzed to determine if excessive cavitation occurred that would contribute to parenchymal injury (Figure S6). We did observe stable cavitation during sonication in all groups. The ultraharmonic frequency measurements did not detect excessive 1.5f0 emissions or persistent 2.5f0 emissions during sonication (Figure S6). (A) Experimental design. Baseline T2w magnetic resonance images (MRI) were obtained to rule out brain abnormalities prior to sonication. Rats then received a single dose of intraperitoneal 5-bromo-2'-deoxyuridine (BrdU) on three consecutive days before the first pFUS+MB treatment. Axial T2w images were obtained by 3 T MRI for sonication treatment planning: Nine 2 mm-diameter non-overlapping focal points were placed on the left cortex covering the area anterior to the lateral ventricle and 4 focal points were placed on the right hippocampus. Pulsed FUS was coupled with 100 μL OptisonTM MB infusion via the tail vein with 5 min between sonications of the cortex and hippocampus. 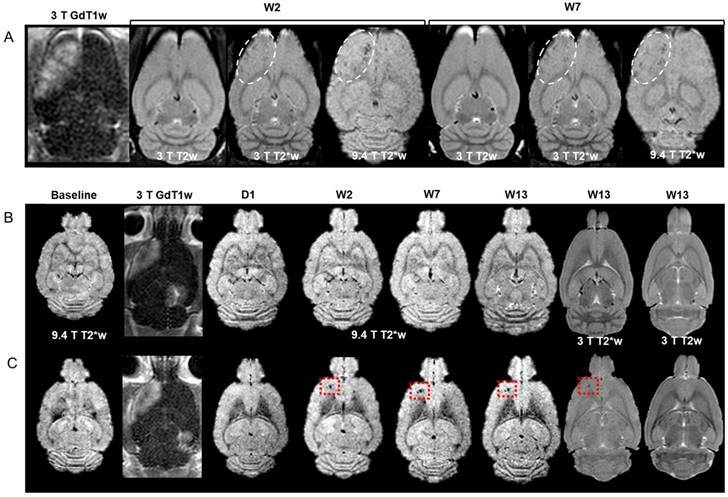 Post sonication T2w, T2*w and Gd-T1w images were obtained by 3 T MRI, and T2w, T2*w images were obtained by 9.4 T MRI on separate consecutive days. Animals were euthanized and brains were harvested for histological examination at either week (W) 7 or 13. (B) GdT1w image at 3 T MRI depicts areas of BBB opening after sonication at PNP=0.3 MPa in the left cortex and right hippocampus. (C) Graphic display of the pFUS+MB experimental protocol. 100 μL OptisonTM was infused over 60 s starting 30 s before pFUS at a rate ~1.6 μL/s. The dashed line depicts changes in blood concentration of #MB over time. (A) Time course of GdT1w, T2w and T2*w MRI at 3 T, and T2w and T2*w MRI at 9.4 T of a Group A rat brain at ~4 mm from the superficial cortex. Hyperintense regions on T1w images indicate BBBD in the left cortex and right hippocampus. Hypointense regions appear at W2 and W7 post pFUS+MB on 3 T and 9.4 T T2*w images (dashed outline). (B-C) Representative images of two Group B rat brains without (B) and with (C) localized abnormalities in the sonicated left cortex ~7.5 mm from the top of the brain surface. (B) GdT1w images reveal areas of BBBD in the cortex and hippocampus. MRI at any time point did not demonstrate any signal intensity change at either field strength in the targeted parenchyma over the 13 weeks. (C) T2*w images 1 day post pFUS+MB were similar to baseline at 9.4 T. A region of focal hypointensity appeared in the left cortex at W2 that persisted to W13 on 3 T and 9.4 T T2*w images that was not apparent on T2w images at 3 T. There were no observable differences between sonicated hippocampus and contralateral brain. Figure S1-3 contain rostral to caudal sets of T2*w images at 9.4 T and T2w, T2*w and GdT1w images obtained at 3 T MRI at W7 or W13 for the rats in (A-C) in order to appreciate the extent of MRI changes in each of the rat brains. For all high resolution MR studies, images obtained at 3 T used a slice thickness of 500 µm and those at 9.4 T used 200 µm. (A-B) Representative MRI from a Group C rat. (A) GdT1w images from the same rat following each of the 6 weekly sonications to the brain. The first three weekly sonications (W1-W3) were performed at PNP=0.3 MPa and the last group of three treatments (W4-W6) at PNP=0.5 MPa. Variable degree of contrast enhancement on GdT1w MRI indicates differences in the degree of BBBD after each sonication. (B) MRI at 3 T at two locations (~4.5 and 7.5 mm from the cortical surface) within the rat brain. Post pFUS+MB images were obtained at one week (W7) following the sixth (i.e., last) treatment. Hyperintense regions in the left cortex on post GdT1w images (dashed lines) demonstrate persistent BBBD at W7 as well as thickening and enhancement of meninges on the ipsilateral side (arrow) with little evidence of contrast enhancement in the right hippocampal region. T2w images clearly show hyperintense regions in the left cortex (dashed line) consistent with astrogliosis and left lateral ventriclomegaly (arrow) compared to contralateral hemisphere. 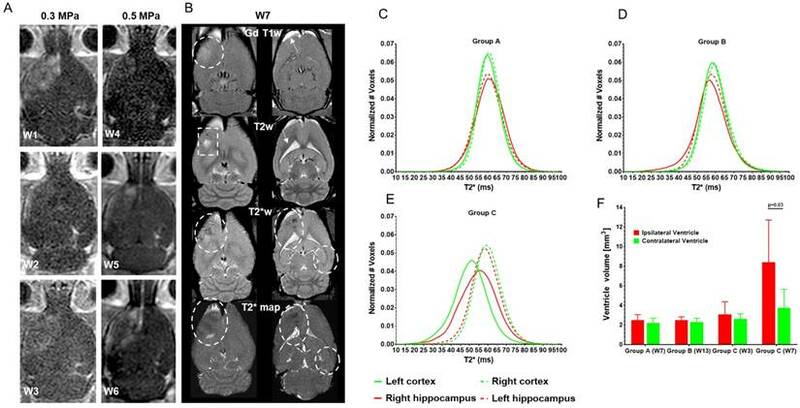 T2*w images and calculated T2* maps reveal hypointense voxels in both pFUS+MB-treated regions of the brain (dashed circles) consistent with damage, micro-hemorrhages or dilated vessels that were present in all rats receiving 6 weekly sonications. Figure S4 contains rostral to caudal sets of T2*w images at 9.4 T and T2w, T2*w and GdT1w images obtained at 3 T scanned at W7 for the same rat. (C-E) Calculated T2* (ms) histograms derived from T2* maps of all voxels in sonicated and contralateral ventricles (n=6/group). There was no significant difference in mean T2* values between pFUS+MB-treated left (Lt) cortex (green line) and right (Rt) hippocampus (red line) compared to contralateral brain (dashed lines) for Group A and B rats. (E) T2* histograms from Group C rats at W7 displaying left shift to significantly lower T2* values for mean and skewness for multiple sonicated Lt cortex (p<0.001, p=0.009) and Rt hippocampus (p=0.044, p=0.02) compared to contralateral brain. Table S1 contains descriptive statistics for mean T2* values, standard deviation, kurtosis and skewness and p values for each of the histograms. Figure S5 contains T2* histograms for Group C rats following the second weekly pFUS+MB exposure. (F) Ventricle volume. Lateral ventricle volume was calculated from 3 T T2w images and demonstrates a significant difference (p=0.03) in the ipsilateral Lt ventricle only in Group C rats following 6 weekly pFUS+MB exposures, consistent with cortical atrophy. Representative hematoxylyn and eosin (H&E) and Prussian Blue (PB) staining of Group B and C rat brains that were obtained at W13 and W7 post pFUS+MB, respectively. (A) H&E stain of an axial brain slice representing the two pFUS+MB-treated areas (dashed lines). (B) High-magnification H&E images reveal a dilated vessel (V) approximately corresponding to the area of hypointense voxels in Figure 2C in a Group B rat that received a single pFUS+MB treatment. Prussian blue staining reveals metallophagocytic PB+ cells scattered in the sonicated cortex (Lt COR, insert red arrow) and hippocampus (Rt HIP, not shown) compared to contralateral brain. Scale bar=100 µm. (C) H&E stain of an axial brain slice from the Group C rat in Figure 3. The dashed highlighted area represents astrogliosis in the multiple treated cortex approximately corresponding to the hyperintense region in the Figure 3B T2w images. The arrow indicates dilated ventricle ipsilateral to the sonicated cortex. (D) Prussian blue staining of sonicated and contralateral cortex and hippocampus demonstrates the presence of PB+ metallophagocytic cells that are primarily activated systemic macrophages and microglia. These cells contribute to the hypointense voxels observed in treated parts of the brain on T2*w MRI. a: tissue artifact; COR: cortex; HIP: hippocampus. Scale bar=1 mm; insert=100 µm (COR) and 200 µm (HIP). Histological evaluations were performed either 7 or 13 weeks after a single or six weekly pFUS+MB exposures. Three 3-5 µm sections were evaluated (Figure 4-6 and Figure S7) either by bright field or IFL and quantitative analysis was performed based on either area measurements of fluorescent pixels or by count. H&E and PB staining from Group B and C rats revealed the presence of dilated vessels, astrogliotic scar and PB-positive metallophagocytic cells (i.e., microglia or CD68+ macrophages) that had phagocytosed red blood cells from microhemorrhages or contained iron metabolites localized in the sonicated regions (Figure 4). The presence of PB+ cells was observed in animals that had hypointense voxels on T2*w images at 3 T. IFL for activated microglia (Iba1) and astrocytes (GFAP), BrdU to identify neurogenesis, and CD68 for infiltrating systemic macrophages showed differences for the sonicated regions compared to contralateral brain for the three cohorts (Figure 5-6 and Figure S7). Quantitative analysis (unpaired t-test) for the Group A animals (Figure 7A) demonstrated that there were relatively small yet significantly different stained areas for GFAP (p<0.02) and Iba1 (p<0.03) between sonicated and contralateral cortex that were not apparent in Group B rats at W13 (Figure 7B). There were also significant increases (Group A: p<0.02, Group B: p<0.05) in the numbers of BrdU+ cells in the treated hippocampi compared to contralateral parenchyma without difference in numbers of cells in the frontal cortexes. The numbers of CD68+ cells detected were also significantly different in sonicated regions compared to contralateral brain for Group A (p<0.03 cortex, p<0.008 hippocampus) and B (p<0.008 cortex, p<0.03 hippocampus) animals (Figure 7A-B). In comparison, Group C rats had significantly greater differences in the stained area of GFAP (p<0.006, cortex) and Iba1 (p<0.0001, cortex, hippocampus) in the sonicated brain compared to contralateral brain at W7 (Figure 7C). There were also significantly greater numbers of BrdU+ (p<0.0001, cortex) and CD68+ (p=0.0001, cortex, hippocampus) cells in the treated regions compared to contralateral parenchyma. Quantitative analysis of the IFL sections revealed a greater systemic immune response along with neurogenesis in Group C rats (Figure 7C) compared to the two other groups. For Group A and B rats, the neuroinflammatory and neuro-proliferative processes appeared to dissipate between W7 and W13 (Figure 7A-B). However, in Group C rats, the increase in immune response and neurogenesis observed may represent the effects of the last (i.e., 6th) pFUS+MB treatment prior to euthanasia or the cumulative effects from multiple sonications (Figure 7C). Histological evaluation of the effect of a single pFUS+MB from a Group A rat brain at W7. (A) The four boxes on the whole mount H&E image indicate the areas where the representative IFL sections were obtained. (B) GFAP and (C) Iba1 staining revealed differences between pFUS+MB-treated Lt cortex compared to contralateral brain. (D) Evidence of BrdU+ cells indicates that neurogenesis was apparent at W7 in the brain and (E) CD68+ macrophages were observed in the sonicated Lt cortex and Rt hippocampus. Scale bar=100 µm; insert is 63x magnified view of stained cells; 4',6-diamidino-2-phenylindole (DAPI) is the blue nuclear stain. (A-E) Immunofluorescent staining of a Group C rat brain following 6 weekly pFUS+MB treatments. (A) Increased GFAP expression in the Lt cortex and (B) increased Iba1 expression in the Lt cortex and Rt hippocampus consistent with astrocytic and microglia activation in the treated brain regions were observed compared to contralateral brain (Rt cortex and Lt hippocampus). (C) BrdU+ and (D) CD68+ cells displayed increased numbers of positive cells in sonicated regions of the brain. Scale bar=100 µm; insert is 63x magnified view of stained cells. (E) High-magnification image of BrdU+ cells in the treated cortex showed increased BrdU staining colocalized with DAPI (blue nucleus). Scale bar=10 µm. (F) Co-localized NeuN+ and BrdU+ cells from sonicated regions compared to (G) contralateral hippocampus. Scale bar=10 µm. Quantitative analysis of GFAP, Iba1, BrdU+ and CD68 staining of sonicated brains at (A) 7 or (B) 13 weeks after a single treatment or (C) 1 week after 6 weekly pFUS+MB treatments. For GFAP and Iba1 staining, the area of positive fluorescence signal was measured using Image J in three consecutive sections (n=6 rats/group). Values represent mean stained area/whole region-of-interest (ROI). BrdU+ and CD68+ cells, co-localized with DAPI, were counted manually in the whole treated area in three consecutive sections from n=6 rats per each group. Statistical analyses were based on unpaired t-test: LC (pFUS) vs. RC and LH vs. RH (pFUS). Asterisks indicate statistically significant elevations (p<0.05). Data are presented as mean ± SD. LC (pFUS): Lt cortex; RC: Rt cortex; RH (pFUS): Rt hippocampus; LH: Lt hippocampus. Multiple courses of pFUS+MB BBBD have been shown to decrease the Aβ plaques burden in Alzheimer's disease experimental models; however, there has been no report of whether multiple sonications would induce changes in pTau deposition in the brain. Figure 8 contains representative examples of pTau in neurons on bright-field and by immunofluorescent staining from sonicated cortex (Figure 8A, 8E) and to a lesser extent in the hippocampus (Figure 8D) in animals that received 6 weekly treatments. 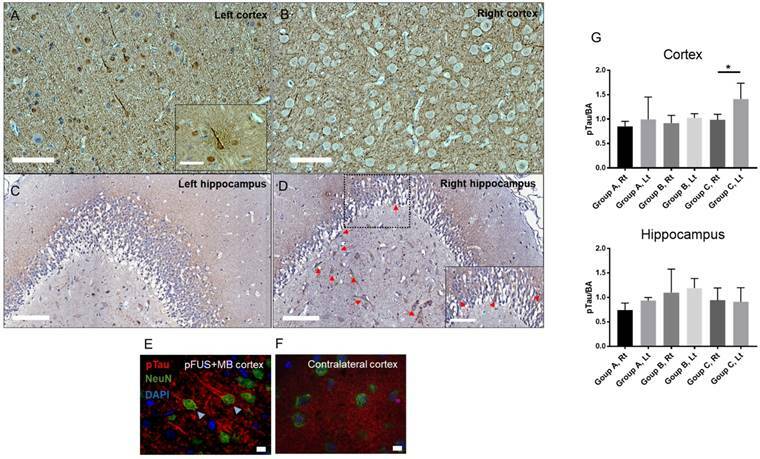 Group A and B rats had rare pTau-positive neurons primarily located in the treated cortex but not in the hippocampus. Western blot analysis for pTau (Figure 8G and Figure S8) revealed significant elevations (p<0.04) in sonicated cortex but not in the hippocampus from Group C rats, whereas there were no differences compared to contralateral untreated parenchyma in the animals that received a single pFUS+MB treatment. Several approaches have been developed to effectively open the BBB that include intra-arterial infusion of hypertonic mannitol or bradykinin or experimental pFUS+MB for drug and gene delivery in order to treat neurological diseases [7, 9, 12-14, 45-48]. Image-guided pFUS coupled with intravenous MB serves as a noninvasive approach for opening the BBB that can specifically target areas within the brain . The interaction of the pFUS with MB confined to the vascular space leads to stable cavitation and transient BBBD via stretching of endothelial cells coupled with the induced expression of CCTF from the NVU and alterations in TJP expression . There are several studies investigating the safety of multiple pFUS+MB openings of the BBB in experimental models [45, 49-51] along with clinical trials (clinicaltrials.gov; NCT02986932, NCT03119961, NCT03321487, NCT02343991, NCT03551249). Experimental studies usually do not incorporate advanced high-resolution imaging and histological techniques as part of their confirmation as to the lack of pathological changes within the targeted brain. Previous reports have correlated MRI findings to limited histological evaluation that includes H&E stains or identification of microglia and astrocytes [21, 45, 50]. A recent safety study in rats that received six weekly pFUS+MB (PNP=0.6-0.8 MPa) at 690 kHz induced BBBD revealed microhemorrhages, macrophage infiltration, cystic cavities and/or dilated small vessels . The authors stated that repeated sonications in the normal brain were essentially safe with limited or no clinical consequences despite the histological finding. pFUS+MB protocols that include PCD feedback control of PNP during pFUS with an injection of MB should be valuable in order to limit pathological changes in treating regional or global neurodegenerative diseases. Histological evaluation of hyperphosphorylated Tau (pTau)-positive cells from a Group C rat after 6 weekly pFUS+MB exposures to the brain. Bright field images of the (A) sonicated cortex and (D) hippocampus with neurons (arrows) containing pTau compared to contralateral regions (B-C) of the brain. Scale bars=100 µm. (E) Triple stained confocal microscopy images of the sonicated cortex show pTau (red) in NeuN+ (green) neurons and axons along with the absence of pTau staining in GFAP+ astrocytes compared to the contralateral cortex (F). Scale bar for (A-D)=100 µm and for (E-F)=10 µm. (G) Quantitative analysis of pTau Western blots (WB) from Lt cortex, Rt cortex, Lt hippocampus, Rt hippocampus and sham control animals normalized to B actin (BA) and plotted as mean ± SD. Statistical analyses were based on unpaired t-test (p<0.04). Figure S8 contains examples of WB from sonicated and contralateral brain used for quantitative analyses. Calculated numbers of MB based on doses provided in Table S2 for a 250 g rat versus reported peak negative pressure for three clinically approved ultrasound contrast agents and custom MB that have been used to open BBB in rat models. pFUS+MB BBBD studies continue to require optimization of the FUS parameter feature space (i.e., FUS transducer frequency, PNP, US burst duration, pulse repetition frequency, numbers of focal targets, MB size, dose and infusion rate) in order to adequately deliver agents or cover the canvas of brain pathology to stimulate an endogenous response that may improve functional outcomes [45, 47, 49, 52-54]. Moreover, consistency in the MRI acquisitions (i.e., Gd dose, slice thickness, T1w, T2w and T2*w imaging parameters) across studies is needed to ensure that pathological changes in the targeted brain are not overlooked. Volumetric image analysis should also be included to assess parenchymal loss. In the current study, lower PNP (0.3-0.5 MPa) for the single or multiple weekly pFUS+MB exposures were performed in order to cover large areas of the brain (Figure 1A-B), as would be used in treating a large focal region (e.g., ≥ 200 cc) or a diffuse neurological disease. The pFUS+MB protocol reported here has been shown to induce a SIR with significant elevations in DAMPs (i.e., HSP70, IL1β) , albumin leakage into the parenchyma, and increased release of pro-inflammatory cytokines (i.e., TNFα, interferon gamma) primarily through the NFκB pathway [2, 5], which have been usually associated with trauma or ischemia [55-59]. To determine if there were prolonged effects of either a single or 6 weekly pFUS+MB in the brain, we monitored pathological changes in the treated parenchyma by MRI followed by histology to understand the long-term effects of the BBBD-associated sterile inflammation. MRI studies performed following a single pFUS+MB BBBD revealed that <50% of the rats had abnormalities on T2*w images. The conspicuity of these hypointense voxels on T2*w images was usually apparent on MRI at 3 T and 9.4 T and would be consistent with either the presence of dilated vessels or iron deposition within phagocytic cells or in the parenchyma. Slow blood flow in dilated vessels could appear as shortened T2* (i.e., hypointensities) due to blood oxygenation-dependent contrast mechanisms that are dependent on the concentration of deoxyhemoglobin in the blood . Animals treated with multiple weekly pFUS+MB exhibited increased numbers of hypointense voxels on T2*w images that initially appeared as early as the second sonication or were visible on week 7 MR scans consistent with parenchymal damage (Figure 3B, 3E, Figure S4-5). 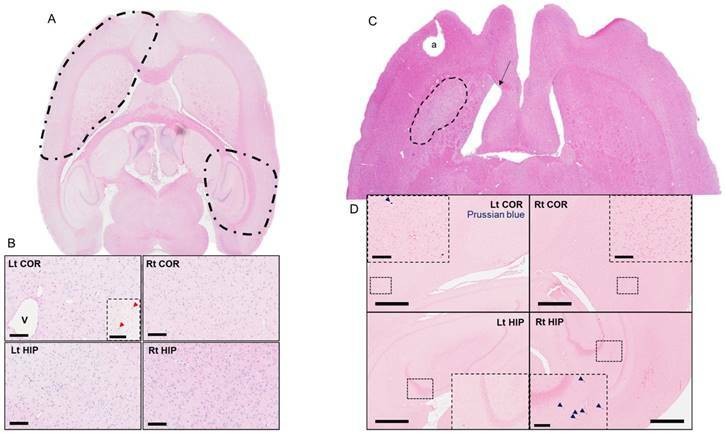 Moreover, all animals in the Group C cohort demonstrated cortical atrophy associated with dilation of the ipsilateral Lt lateral ventricle consistent with cellular loss (Figure 3F). In half of these animals, the BBB remained open one week following the last sonication (Figure 3B). In comparison to other multiple weekly pFUS+MB BBBD studies in the rat in which MRI was used for follow-up and where there were limited pathological changes, the current study clearly showed pathological changes in sonicated regions at 3 T that were confirmed on 9.4 T scans (Figure 3B). Our MRI protocols include acquiring voxels with a size of 100×100 µm in-plane and 500 µm slice thickness at 3 T in a solenoid receive only coil or 200 µm3 voxels at 9.4 T with a birdcage coil in order to provide high-resolution scans thereby limiting partial volume effects. In comparison, MRI studies performed at various field strengths (3-7 T) using surface coils and acquired images with 0.8-1.5 mm slice thicknesses and in-plane resolution >200 µm2 following sonication could have under-appreciated or missed pathological changes in the brain because of partial volume effects [2, 47, 61-65]. Future studies should strive to optimize MRI protocols to include higher spatial resolution imaging along with quantitative T1 and T2* maps, and possibly include advanced imaging techniques, such as chemical exchange saturation transfer imaging , diffusion basis spectrum imaging , or diffusion tensor imaging, [68, 69] to interrogate metabolic, morphological and pathological changes in the brain following multiple pFUS+MB BBBD. There are differences between the pFUS+MB protocol and histological observations in this study compared to previous reports in which multiple sonications in animal models were performed that need to be addressed. In the current study, the normalized focal area at 548 kHz was 2.5 mm by 17.6 mm at full width half-max calibrated at 1.5 W (equivalent to 1 MPa provided by FUS Instruments, Toronto, ON). pFUS targeting areas were set at 2 mm on center to each other based on our observation on post GdT1w images at 3 T in which the diameter of contrast enhancement was <2 mm and would allow for close placement of focal points in the cortical and hippocampal regions (Figure 1B). The goal of this pFUS spacing protocol was to provide as complete coverage of the targeted regions as possible that would be used to deliver agents or stimulate an immune response in the diseased brain. 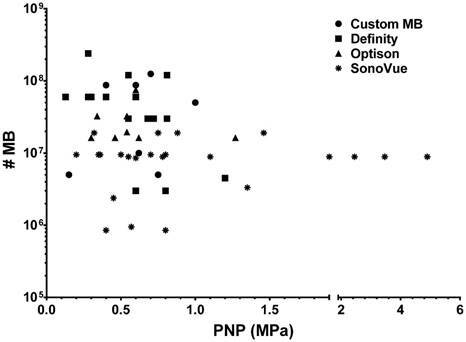 Other reports have used either closely spaced or overlapping foci for pFUS using various sonication parameters coupled with an infusion of MB to open the BBB [4, 47, 61, 63, 64]. Moreover, it has been reported that pFUS with PNP 0.4-0.6 MPa coupled with an infusion of custom MB injected at a dose 3.5×105/g (i.e., 7×107 MB in 200 g rat) did not result in temperature elevations by MR thermometry . Given the sonication parameters of 10 ms US burst and PRF of ~0.5 Hz, which translates into ~222 ms between focal spots, therefore, it is unlikely in the current study that temperature elevations contributed to the changes observed on T2*w MRI. In addition, the H&E findings (Figure 4) were inconsistent with thermal damage since the histologic changes observed for Group A and B rats when MB was the greatest in this study did no show evidence of necrosis but injury was more consistent with mild vascular injury or trauma. In this current study, rats were anesthetized with isoflurane anesthesia while inhaling 100% O2 during pFUS+MB opening of the BBB as compared to other reports in which rats were administered 21% O2 . OptisonTM and Definity® have an intravascular half-life (T1/2) of 1.3 min in 21% O2, which is shortened by ~40% to 0.72 min when animals inhale 100% O2 [71-73]. MB perfluorocarbon gas is eliminated through the lungs and its clearance rate is governed by first-order principles . Pharmacokinetic modeling would indicate that the infusion rate, initial concentration of injected MB, plasma concentration of MB, T1/2, volume of distribution, and oxygenation status all contribute to the numbers of MB exposed to pFUS PNP over the sonication period used to cause BBBD . It has been reported that pFUS+MB BBBD experiments performed while animals inhale 100% O2 resulted in less enhancement on GdT1w MRI compared to when animals inhaled 21% O2 . In addition, animals on 100% oxygen had a greater amount of wideband emissions that could have led to an increase in the number of petechia compared to animals breathing air , which may appear as hypointense voxels on T2*w MRI. It is important to note that repeated pFUS treatments for opening the BBB with OptisonTM and Definity® required 6.5 min (5×T1/2=390 s on 21% O2) in order to avoid the presence of residual intravascular MB in new targeted brain regions . The protocol used in the current study did not incorporate PCD feedback to control the PNP during sonication. pFUS PNP was fixed at either 0.3 MPa on Day 0 for all groups of rats and increased to 0.5 MPa after the 3rd sonication in Group C rats. We changed the pFUS+MB parameters after the 3rd sonication in order to obtain visible BBBD on GdT1w MRI at 3 T. Lower PNPs with the same experimental conditions did not result in reliable or discernible contrast enhancement on GdT1w images. PCD data were not consistent with excessive cavitation doses based on emissions >3.5× baseline at 1.5f0 and 2.5f0 across the multiple focal points (Figure S6). Furthermore, broadband signal analyses did not show evidence of inertial cavitation (data not shown). As part of a preliminary study, we preformed pFUS with PCD feedback algorithm (FUS Instruments, Toronto, ON) in combination with the OptisonTM infusion protocol (Figure S9). There was clear evidence at one focal point starting at the ~30th US burst of the ratio at 0.5f0, 1.5f0 and 2.5f0 being greater than 3.5× the ratio from the earlier US burst (<30), yet the algorithm did not feedback appropriately on the PNP, allowing pFUS pressures to reach >1 MPa before the appropriate decrease should have occurred. It is possible that the specific PCD feedback algorithm approach  was not intended to be used with MB present within the vasculature (Figure 1C) along with a subsequent delayed start of pFUS in order to open the BBB. For this reason, PCD feedback was not used in this study. For this reason, PCD feedback was not used in this study. There is controversy surrounding the protocol consisting of a fixed number of MB (OptisonTM dose=5-8×107 MB or 460 µL/kg to 377 µL/kg over 6 weekly sonications) for Group C rats administered IV prior to the start of sonication as compared to other studies [2, 20, 54, 74]. It has been stated that the OptisonTM dose used in this study is 8 to 10× the clinical imaging dose [2, 19, 52, 73]. The statement assumes that the current study did not abide by a “standardized preclinical protocol” of pFUS+MB to open the BBB. The statement ignores the fact that there is variability in experimental designs in the literature without a discernable standard. Differences in protocols included: the type of MB including coating; MB dispersity; infusion rate; the level of inhaled O2; initiation of pFUS in relation to MB concentration in the vasculature; as well as the number of foci per region of the brain. Review of the literature would suggest that there is no optimal protocol for the MB dose (independent of US contrast agent being used) and US PNP to cause BBBD. A PubMed search in early 2018 using terms “focused ultrasound, blood brain barrier, safety, and rat” resulted in over 70 published reports with about half providing sufficient information on PNP, type of US contrast agent (SonoVue®, Definity®, OptisonTM or custom-made MB), and either µL/kg or #MB/kg dose used in safely opening the BBB. Figure 9 is a graph of PNP versus calculated number of MB that would be administered to a 250 g rat to open the BBB based on the available information in Table S2. There was no consistent dose or number of MB for the 3 clinically approved US contrast agents and custom MB that have been coupled with pFUS at various frequencies and PNP that result in BBBD (Table S2). Most of these reports did not use PCD feedback to determine the possible optimal PNP for BBBD. When evaluating the utility of pFUS+MB to clear Aβ plaques from the AD mice brains, it is also apparent that a wide range of sonication parameters and MB concentrations has been used. In one study, pFUS (PNP=0.118+/-0.15 MPa) under PCD feedback control was accompanied by an injection of 20 µL/kg Definity® . Multiple weekly pFUS (PNP 0.3 MPa) with an injection of 80 µL/kg Definity®  (i.e., 8× the clinical imaging dose of 10 µL/kg) was used to open the BBB and allow influx of endogenous antibodies to clear Aβ plaques, presumably by inducing an inflammatory response [20, 74]. Another study used scanning ultrasound (SUS) at PNP=0.7 MPa without PCD feedback with a bolus of custom-designed MB at a dose of 4 mL/kg (i.e., 1-5×107 MB/mL or calculated #MB in 25 g mouse=3.5×106 MB) . Although it is difficult to directly compare pFUS+MB studies between mice and rats, it appears that the pFUS parameters used in the current study, except for the number of focal spots per PRF, are similar to those used to cause BBBD and clear plaques in AD mice. Moreover, in each of these AD mice studies, multiple weekly sonication studies did demonstrate microglial activation in association with pFUS+MB exposure, but neuropathological examinations for changes in pTau or the presence of NFT in the targeted brain were not performed. These results indicate a need to standardize pFUS+MB protocols that may include real-time PCD with ultraharmonic and broad band emission detection feedback schema  to potentially minimize parenchymal damage while still allowing sufficient BBBD to deliver neurotherapeutics or stimulate immune responses. Regarding MB dosing with pFUS, the Food and Drug Administration (FDA) provides dosing guidelines in the product inserts of OptisonTM (http://www3.gehealthcare.com/~/media/documents/us-global/products/contrast-media_non-gatekeeper/clinical-product-information/optison/gehealthcare_optison-prescribing-information.pdf), Definity® (http://www.definityimaging.com/prescribing_info.html) and SonoVue® (Lumason®, https://imaging.bracco.com/us-en/products/contrast-enhanced-ultrasound/lumason) to be used as injections for US imaging. There are no indications for the use of these US contrast agent MB in combination with pFUS to open the BBB in their respective product inserts. The use of MB with pFUS would be considered an off-label use of the US contrast agents. The combination of MB with pFUS to open the BBB would necessarily be part of an institutional review board (IRB)-approved protocol that would define the dosing and infusion rate based on the risk-benefit analysis provided by the medically responsible investigator filed with their appropriate regulatory commission. Infusions of FDA-approved MB for BBBD may need to be performed at levels greater than those recommended for image contrast according to the goals of the BBBD study (e.g., stimulation of cellular and humoral immune responses to clear amyloid plaques). Of note, it has recently been reported that following a single or multiple injections of Definity® or OptisonTM, antibodies most likely developed through a T-cell independent mechanism, which resulted in an effectively shorter half-life (T1/2) due to clearance from the vasculature by macrophages . Based on this study, it will probably be necessary to adjust MB dose used with pFUS in studies where multiple BBBD are planned for delivery of neurotherapeutics or stimulation of the immune system . The pathological results following a single or 6 weekly pFUS+OptisonTM induced BBBD in this study are consistent with observations on H&E (Figure 4) from other reports in which areas of microhemorrhages, astrogliosis and microglial activation were detected [76, 77]. In Groups A and B rats, the differences between sonicated ipsilateral and contralateral brain decreased with time post sonication by GFAP and Iba1 staining and there were fewer BrdU+ and CD68+ cells in the targeted regions (Figure 5, Figure S7). 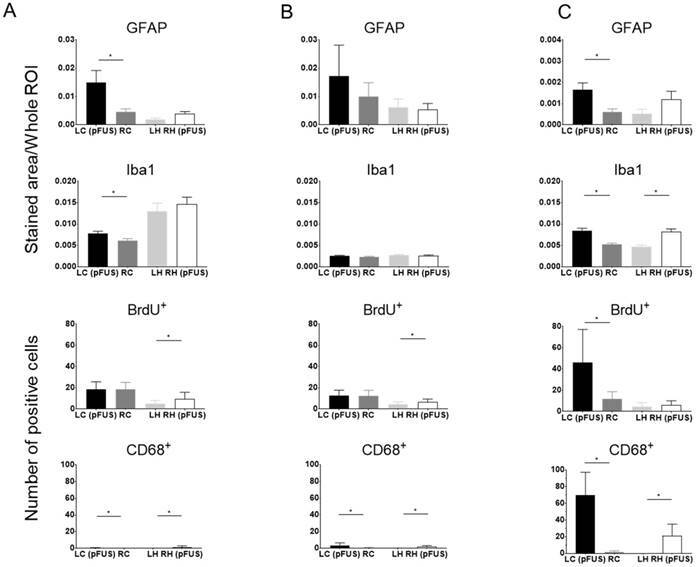 For Group C, in which animals were euthanized 1 week after the 6th sonication, there was significantly increased microglia and astrocyte activation along with increased numbers of BrdU+ cells and CD68+ cells compared to contralateral parenchyma. In these animals, the apparent difference in Iba1 staining in the treated cortex and hippocampal regions (Figure 6) may reflect the proliferative response of microglia in the presence of chronic inflammation that is detected in AD models [78, 79]. The enhanced neurogenesis following pFUS+MB infusion may depend on the US parameters used, with the result of increased expression of trophic factors such as brain-derived neurotrophic factor in the targeted brain . MRI-guided pFUS+MB studies are being proposed as a method to facilitate treatment of neurodegenerative diseases. The combination of pFUS or SUS with MB infusion in AD models has facilitated clearance of Aβ plaques and pTau from the parenchyma [7, 21-26, 36, 38, 76, 80]. Single and multiple courses of pFUS+MB have also resulted in detectible increases in neurogenesis. It has been hypothesized that the enhanced neurogenesis in both wild type and AD mouse models was associated with an increase in trophic factors such as vascular endothelial growth factor, brain-derived neurotrophic factor, stromal-derived factor-1 alpha and erythropoietin [7, 23, 81-87]. It has been reported that pFUS+MB-induced BBBD increases these trophic factors coupled with antiapoptotic signaling [2, 4]. We hypothesize that pFUS-induced stable cavitation of MB affects the cellular components of the NVU, inducing increased transient expression of CCTF and CAM that results in a SIR, activating microglia along with an innate immune response that contributes to Aβ plaques clearance [2, 20, 23, 38, 74]. Future long-term investigations will be required for the durability of Aβ plaque clearence or if a paradoxical rebound effect can occur overtime resulting in an increase in the numbers of Aβ plaques or other pathology (i.e., NFT) in the regions of previously sonicated brain. The accumulation of pTau NFT in neurons has been associated with AD, frontal lobe dementia and chronic traumatic encephalopathy (CTE) [88-92]. The combination of pTau NFT and Aβ plaques has been associated with neurotoxicity in AD . The ability to clear pTau NFT in AD has been limited because of the inability of antibody-based treatments to cross the intact BBB . The combination of SUS+MB caused BBBD in a human Tau transgenic pR5 mouse model and provided the means to increase delivery of antibody fragment RN2N, resulting in decreases in total Tau with improvements in neurobehavioral studies . The RN2N antibody fragment was shown to inhibit glycogen synthase kinase 3 beta (GSK3β) phosphorylation of Tau in neurons  that can result in the overproduction of Tau and the formation of NFT . Previous studies have reported increases in phosphorylated GSK3β expression in the brain within the first 24 h after sonication [2, 95, 96]. It is possible that multiple pFUS+MB-mediated BBBD would increase phosphorylated GSK3β expression and drive the formation of pTau in the targeted “normal” parenchyma, as observed in the current study or in other non-tauopathy-associated diseases. However, it is unknown whether multiple weekly pFUS+MB BBBD can result in increases in pTau in clinical trials . The pFUS+MB protocol used in this study was reported to induce a SIR with significant elevations in DAMPs, albumin extravasation into the parenchyma, and increased expression of pro-inflammatory CCTF and CAM primarily through the NFκB pathway [4, 5]. Frontotemporal dementia patients with a FTDP-17T phenotype have tauopathy that is associated with neuroinflammation, elevations in IL1β and COX2, microglia activation and infiltrating systemic macrophages in the brain . Interleukin 1β is elevated in AD patients and overexpression has been shown to reduce Aβ plaques by activating microglia [28, 30]. Interleukin 1β also has a detrimental effect by increasing phosphorylated Tau pathology in an AD mouse model . Increases in IL1β and COX2 protein or gene expression have been observed following pFUS+MB . In the current study, we detected significant increases in pTau in Group C rats confined to sonicated cortex but not the hippocampus (Figure 8G, Figure S8). It is unclear why Group C rats did not have quantitative elevation in pTau in the sonicated hippocampus, but possible explanations may include skull thickness differences over the two sonicated regions and neuronal loss. Another possibility is that we sonicated using the same PRF (i.e., ~1.8-2 s) 4 focal spots for the hippocampus and the associated decrease in duty cycle between US burst versus 9 for the cortex may have contributed to the lack of findings. In addition, sufficient protein from the sonicated hippocampus, while avoiding cortex covered in the focal area, could be extracted for WB from 3 of 5 Group C animals, which may have contributed to the inability to detect increased pTau by molecular analysis. We propose that the increased presence of pTau in animals receiving 6 weekly sonications would be linked to the repeated BBBD and sterile inflammation contributing to neurodegenerative processes . We did not observe increases in pTau following a single treatment of pFUS+MB and it is possible that clearance of the damaged pTau-containing neurons occurred over time [98, 99]. Single or multiple contusions have been associated with moderated to severe traumatic brain injury that can result in increased pTau with the presence of NFT consistent with CTE [91, 98, 99]. It is also possible that the coupling of repeated high PNP pFUS+MB BBBD that results in vascular injury and parenchymal damage  can be developed into a possible noninvasive model of CTE [89, 100]. There are some limitations of this study that should be addressed. The number of animals per cohort was limited to six primarily because of the availability of MRI and pFUS that could be performed over 13 weeks. We plan to perform longer follow-up studies in the 6 weekly pFUS+MB-treated animals to determine if our MRI results (i.e., hypointense voxels, BBBD and atrophy) would be altered. It is possible that there would be clearance of the inflammatory response (i.e., activated microglia, CD68+ cells) and pTau over time in animals receiving multiple sonications . The cellular inflammatory changes detected at week 7 following multiple sonications may reflect pathological changes due to the last pFUS+MB treatment. Future studies should evaluate MRI and histological changes 1 week after a single pFUS+MB treatment. The effects of repeated pFUS+MB on the glia limitans, meninges, associated vasculature [101, 102], or alterations in lymphatic drainage  will require further investigation. This study should be repeated in experimental AD models with a gyrencephalic brain (i.e., swine or canine) [47, 104, 105] since it is unknown whether the pFUS+MB would induce a similar magnitude of SIR in humans [2, 106] as observed in the lissencephalic rat brain. It is also unknown if the pathology observed in the current study is related to the brain size or reflection of the FUS from the base of the skull . It has been reported that multiple courses of pFUS+MB to the hippocampus or motor cortex either did not alter neurobehavior [49, 51] or was associated with improvements in functional memory . The results reported here do not completely recapitulate MRI findings from other safety studies involving multiple sonications in healthy experimental subjects and in AD models primarily due to the differences in the pFUS+MB, MRI and pathological protocols used along with sonicated volume of parenchyma and the image analysis performed [7, 21, 23, 45, 47, 51, 52, 108-110]. In summary, pFUS+MB BBBD in the cortex and hippocampus was monitored by serial MRI and histology. We observed biological variability across the two cohorts of animals receiving a single pFUS+MB exposure based on MRI and histology. In comparison, 6 weekly pFUS+MB resulted in significant pathology reflected on MRI and histology presumably resulting from repetitively induced sterile inflammation. The SIR associated with multiple pFUS+MB treatments could contribute to clearance of amyloid plaques from AD patients by stimulating the innate cellular immune system as well as resulting in elevations in pTau levels detected in the cortex of the healthy brain, raising concerns about the feasibility of using this approach in clinical trials that will encompass areas of existing neuropathology. Further investigation is recommended to monitor the inflammatory responses in the brain to multiple pFUS+MB exposures to open the BBB by advanced imaging techniques [68, 111] prior to implementing this approach broadly in clinical trials of neurological diseases. Aβ: amyloid β; BA: beta actin; BBB: blood-brain barrier; BBBD: blood-brain barrier disruption; BrdU: bromo-deoxyuridine; CAM: cell adhesion molecules; CCTF: cytokines chemokines and trophic factors; CD68: cluster of differentition; CNS: central nervous system; COX2: cyclooxygenase 2; CTE: chronic traumatic encephalopathy; DAMP: damage-associated molecular pattern; DAPI: 4',6-diamidino-2-phenylindole; f: frequency; Gd: gadolinium; GFAP: glial fibrillary acidic protein; GSK3β: glycogen synthase kinase 3 beta; HSP70: heat shock protein 70; H&E: hematoxylin and eosin; Iba1: ionized calcium-binding adapter molecule 1; IFL: immunofluorescent staining; IL: interleukin; Lt: left; MB: microbubbles; NFT: neurofibrillary tangles; NFκB: nuclear factor kappa-light-chain-enhancer of activated B cells; NVU: neurovascular unit; PB: Prussian blue; PCD: passive cavitation detection; pFUS: pulsed focused ultrasound; PNP: peak negative pressure; PRF: pulse repetition frequency; pTau: hyperphosphorylated Tau; ROI: region-of-interest; Rt: right; SIR: sterile inflammatory response; S: signal intensity; SUS: scanning ultrasound; TE: echo time; TJP: tight junction proteins; TNFα: tumor necrosis factor α; TR: repetition time; TSE: turbo spin echo; US: ultrasound; VOI: volume-of-interest; W: week; w: weighted; WB: Western blot. This work was supported by the Intramural Research Programs of the Clinical Center and of the National Institute of Biomedical Imaging and Bioengineering at the National Institutes of Health. Dr. Tsang-Wei Tu was funded by the Department of Defense through the Center for Neuroscience and Regenerative Medicine (Henry M. Jackson Foundation Award #308049-10.01-60855, USU Site No. CNRM-89-3899). JAF, ZIK, TW.T conceptualized study and designed experiments. ZIK, TW.T, MS, BKL, FQ, SRB and NJ carried out the experiments, collected data and analyzed the data. ZIK, JAF wrote the paper.